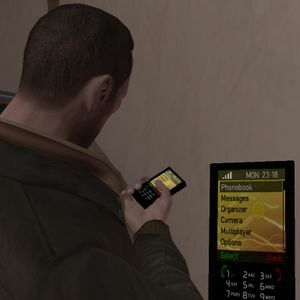 In [[Grand Theft Auto IV]], [[The Lost and Damned]] and [[The Ballad of Gay Tony]], '''cheats''' are activated by typing the cheat phone number into [[Niko Bellic]]'s, [[Johnny Klebitz]]'s, [[Luis Fernando Lopez]]'s [[Cell Phone|mobile phone]]. After this has been done once, the cheat will be stored in the phone, and accessible from the "Cheats" menu there. *Another cheat to get full health, armour, ammo and repair one's vehicle can be used if the player is driving the [[Mr. Tasty]]; cycle through the ice cream jingles (using the horn button) until the GTA IV theme plays, then call the [[ZiT]] Service (948-555-0100). Although not documented as such, this counts as a cheat and blocks achievements. The downloadable content adds cheats to spawn new vehicles. These do not block any achievements or trophies. In addition, any of the cheats from the main game can be used, and do not block any [[Achievements_in_GTA_IV#The Lost and Damned|achievements in The Lost and Damned]]. This list of phone numbers can be found at [[The Lost]]'s clubhouse in [[Acter]], in the form of a flyer listing the vehicles either for sale or as a prize for a contest.